Swimming can be great exercise, but be careful where you dive in. New research shows that swimming in indoor pools can expose you to chemicals that may increase the risk for cancer and respiratory ailments, such as asthma. Ironically, researchers say that the danger is created, in part, by pool chemicals used as disinfectants. These chemicals react with natural organic matter and with people’s sweat, urine and skin cells to form disinfection by-products (DBPs). 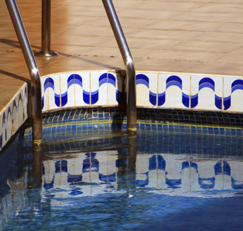 The greatest hazards are specifically linked to chlorine and bromine, both of which are used to rid pools of bacteria and other harmful substances. These chemicals are used in all pools, indoor and outdoor, but sunlight and air help to evaporate and dissipate the chemicals in outdoor pools. Researchers in Germany, Greece, the Netherlands, Spain and the US carried out a human-exposure study to evaluate the risks of DBPs from water in indoor swimming pools. Scientists identified more than 100 DBPs in pool water and investigated the potential for damage to DNA (called genotoxicity) among swimmers exposed to them in chlorinated pools. These studies were the first to combine a comprehensive catalogue of DBPs from waters in indoor pools with measurements of substances that are known to induce genetic mutation. To learn more about this disconcerting research, I contacted Susan Richardson, PhD, the lead author on one of three papers from this study, recently published in Environmental Health Perspectives, a journal of the National Institute of Environmental Health Sciences. Dr. Richardson is an expert on DBPs at the US Environmental Protection Agency (EPA) and was eager to share her knowledge. She told me that the extent of the increased risk hasn’t yet been quantified — at present scientists don’t know much about how likely people are to contract health problems after being exposed to DBPs while swimming in indoor pools, nor how much time in the water poses a danger. DBPs can be inhaled or ingested by swimmers or absorbed through the skin. Respiratory effects, such as asthma, also have been previously documented from exposure to indoor pools. Earlier epidemiologic studies found an association between exposure to DBPs in drinking water and risk for bladder cancer. Another recent study found a slight association of bladder cancer with exposure to indoor pools. Note: These results are challenging to interpret due to the difficulty of disentangling exposures from swimming and those from showering, bathing and other activities involving chlorinated tap water. Swimming vs. Drinking the Water — Which is More Dangerous? While many of the chemicals found in Dr. Richardson’s current pool study were the same as those found commonly in tap water, she said that the potential for damaging exposure through inhalation and absorption through the skin may be greater from swimming than from drinking — most especially when a person is totally immersed for long periods of time. I don’t spend much time in pools, but many people I know believe swimming is the “perfect form of exercise,” so I found this to be worrisome. Of particular concern are the many kids who compete on swim teams. In fact, during the 2000 Olympic Games in Australia, one-quarter of the US swim team suffered some degree of asthma… and, shockingly, a study of 10-year-old children in Brussels who swam in a school indoor pool an average of 1.8 hours a week showed a particular type of lung injury equal to what would be expected in heavy smokers. There is a need for more research on this topic. While the available information doesn’t warrant advice to avoid swimming in indoor pools altogether, this evidence does raise questions about the wisdom of spending lots of time in them.